Ford Madox Brown (1821–1893), An English Autumn Afternoon, 1852-1853 (detail) (1854), oil on canvas, 71.7 x 134.6 cm, Birmingham Museum and Art Gallery, Birmingham, England. Wikimedia Commons. The first article looked at the emergence of the earliest pure landscape paintings among the Pre-Raphaelites, what their characteristics are, and how those arose. Central to the Pre-Raphaelite movement was the quest for ‘truth’, an issue which the critic John Ruskin considered in exhaustive detail in his first volume of Modern Painters, published in 1843. So the first and foremost quality which we should expect in a Pre-Raphaelite landscape painting is truth to Nature. Instead of the carefully composed and manicured composite landscapes of Claude and Poussin, or even the gently tweaked and re-arranged views of Reynolds and Constable, we should see in these early Pre-Raphaelite landscapes details which are true to what was actually there. Fortuitously, although most of the landscapes which I will show in this series are now, a century and a half later, impossible to assess, there are two views whose content has changed relatively little over that time. Burchett’s View Across Sandown Bay, Isle of Wight was painted from the path which still runs to the west of Saint John’s Church (now known as Saint Blasius’), Shanklin, towards Cliff Copse, and on to the village in which I live. 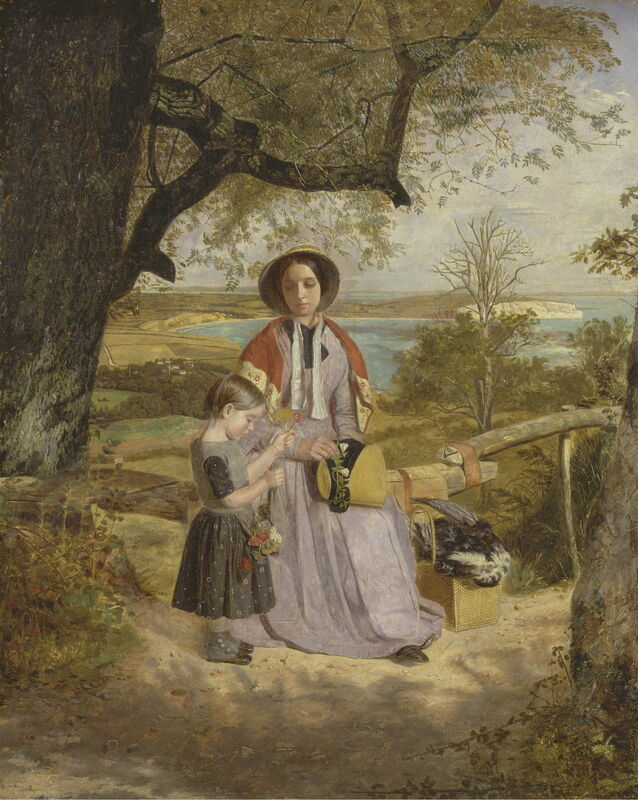 James Collinson (1825–1881), Mother and Child by a Stile, with Culver Cliff, Isle of Wight, in the Distance (c 1850), oil on panel, 52.7 x 42.2 cm, Yale Center for British Art, New Haven, CT. Courtesy of The Yale Center for British Art. 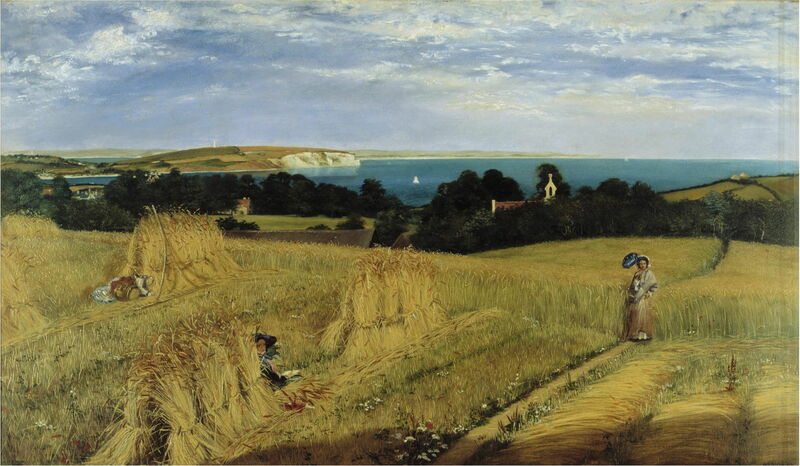 Collinson’s Mother and Child by a Stile, with Culver Cliff, Isle of Wight, in the Distance was painted further up and west along that path, at the eastern end of Cliff Copse. It is written that either or both the views were made from above or beyond Shanklin Down, which is incorrect: they were both made to the north-east of that down, which towers above those locations. For some time, I believed that there were two significant discrepancies between the paintings and the views which the artists would have seen: the distant white tower, which is the Earl of Yarborough’s Monument, appeared too far to the left in both, and in Burchett’s painting, Saint John’s Church appeared incorrect. Although I still have doubts about the church, and about the exact site from which Collinson painted his view, I have since discovered that the distant monument is placed correctly, as it was moved from there to its present location in the 1860s. However, relative to the actual views and photographs of them, both Collinson and Burchett have exaggerated the vertical scale relative to the horizontal, a common adjustment which many landscape painters do unwittingly. I can find no evidence that either took the sorts of liberties in moving, removing, and rearranging features in the landscapes which Constable, for instance, might have done. 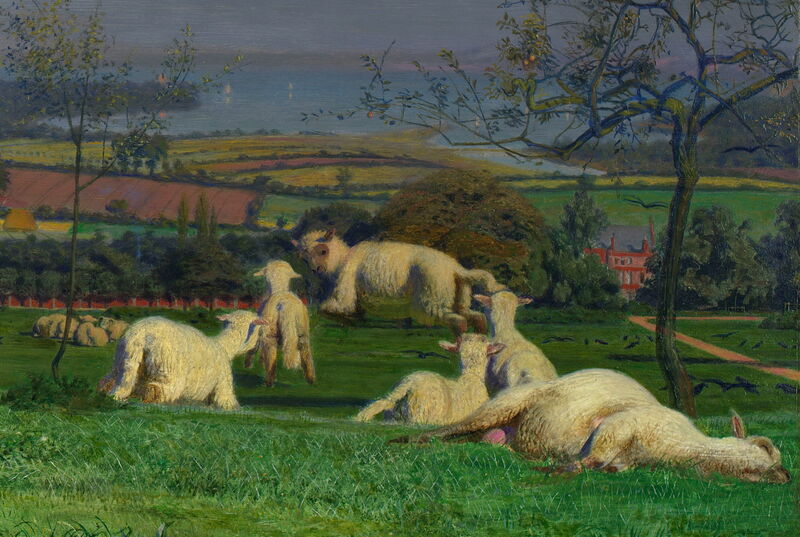 Ford Madox Brown (1821–1893), Pretty Baa-Lambs (detail) (1851/59), oil on panel, 61 x 76.2 cm, Birmingham Museum and Art Gallery, Birmingham, England. Wikimedia Commons. Truth in detail is also difficult to assess. Ford Madox Brown’s Pretty Baa-Lambs (1851/9) has some strange passages which cannot represent reality: the flying sheep are probably the most obvious, but I think that reflects his own artistic development and the general lack of understanding of animal movement at the time, more than anything else. The problem with achieving this truth in detail – indeed, the devil in the detail – was the time and labour required. 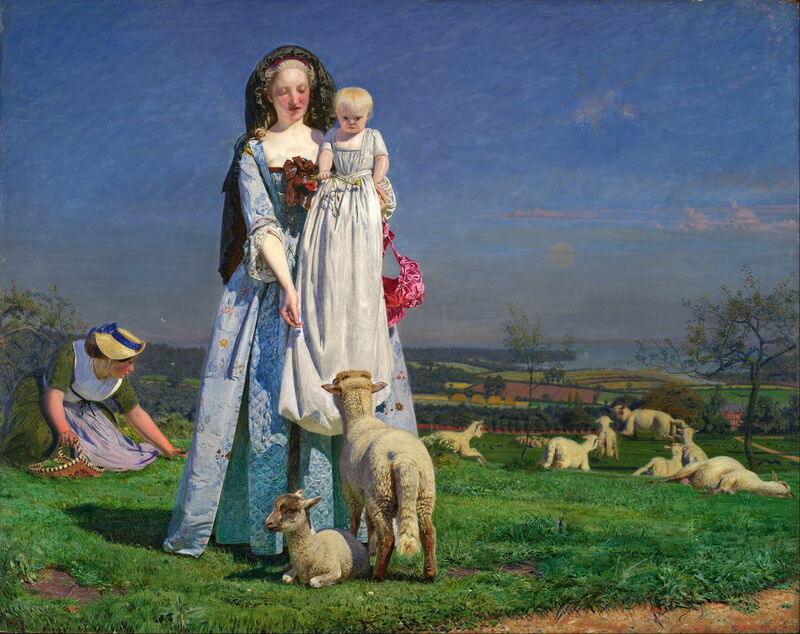 Ford Madox Brown took five months to paint Pretty Baa-Lambs during the summer of 1851. It had to be painted almost entirely in full sunlight, with the lambs and sheep being brought each day from Clapham Common, where they grazed, to Brown’s house in Stockwell, south of London. Ford Madox Brown (1821–1893), Pretty Baa-Lambs (1851/59), oil on panel, 61 x 76.2 cm, Birmingham Museum and Art Gallery, Birmingham, England. Wikimedia Commons. But that only provided part of the landscape: other sections were painted in from Clapham Common, and the background was composed from two views of the estuary of the River Thames below London, which Brown had painted in 1846 and 1849. Those additions were painted in during the autumn of 1852 and spring of 1853, and later. The figures were also reworked in the spring of 1852, and again later. The landscape that you see in Pretty Baa-Lambs is as synthetic as any of Poussin. 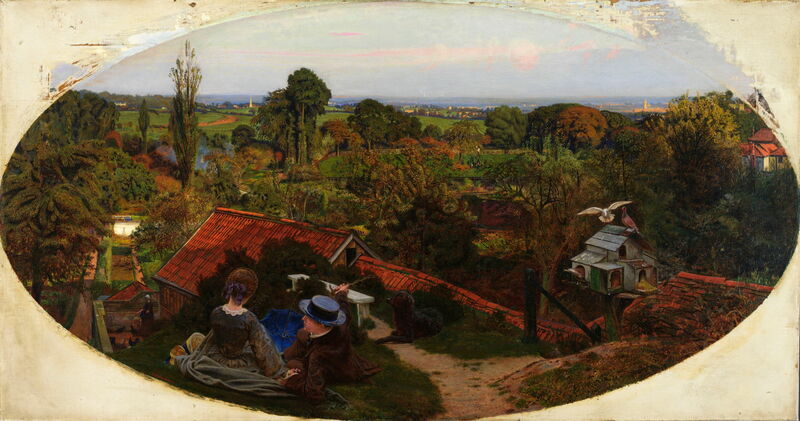 Ford Madox Brown (1821–1893), An English Autumn Afternoon, 1852-1853 (1854), oil on canvas, 71.7 x 134.6 cm, Birmingham Museum and Art Gallery, Birmingham, England. Wikimedia Commons. 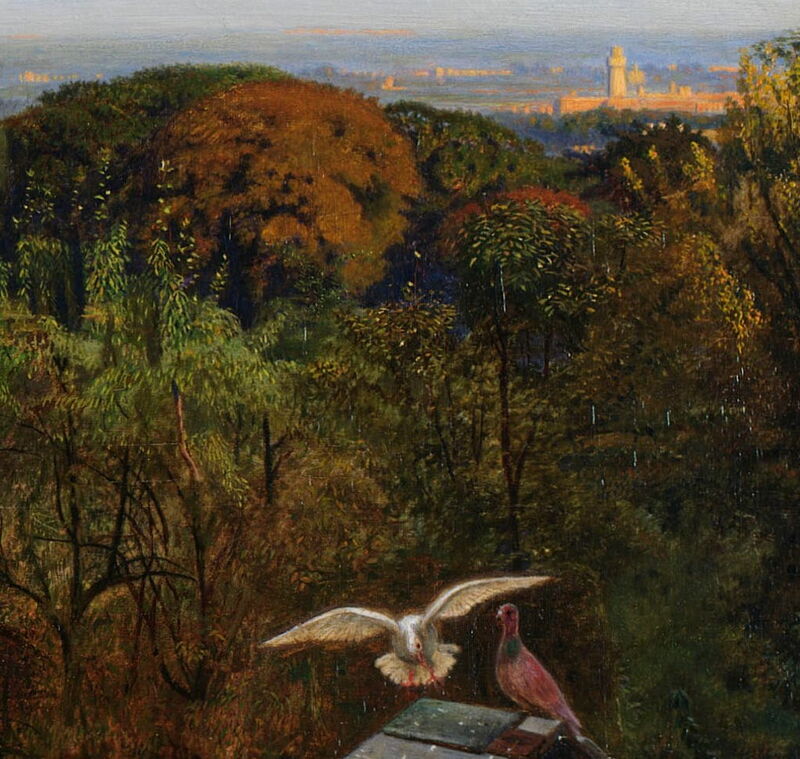 Brown’s next and purer landscape painting was An English Autumn Afternoon, 1852-1853 (1854), painted from his landlady’s bedroom window in Hampstead, looking over Hampstead Heath and the churches of Highgate, London’s suburbs. This took him a month of painting in October 1852, another month the following autumn, and a further two months before he sold the painting in June 1854, although in this case the view appears relatively natural. 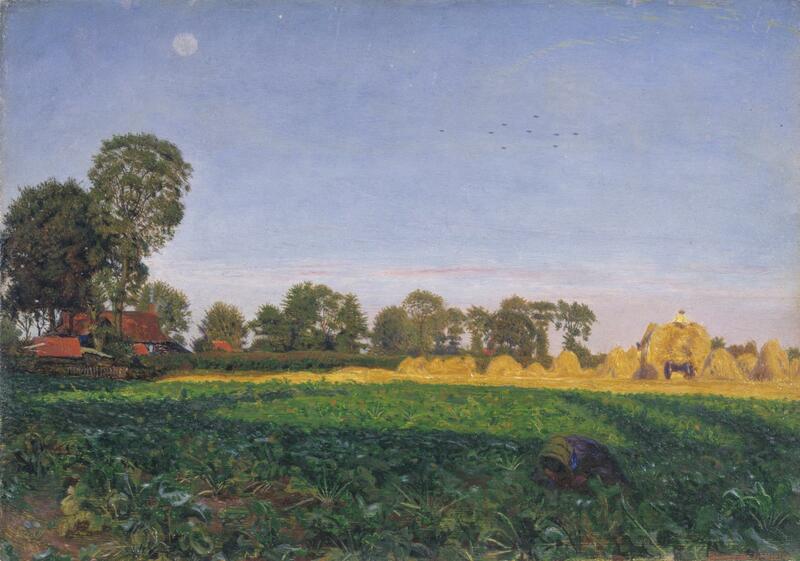 Even this much simpler ‘potboiler’, Carrying Corn, hardly rich in the truth of detail, proved to need more than a month of painting every evening, when the light was reasonably consistent. Thomas Seddon (1821–1856), Léhon, from Mont Parnasse, Brittany (1853), oil on canvas, 57.5 x 74.9 cm, Museo de Arte de Ponce, Ponce, Puerto Rico. Wikimedia Commons. It was also becoming clear that the technical difficulties of making such detailed paintings in front of the motif were altering the results in a way that made them appear unreal. 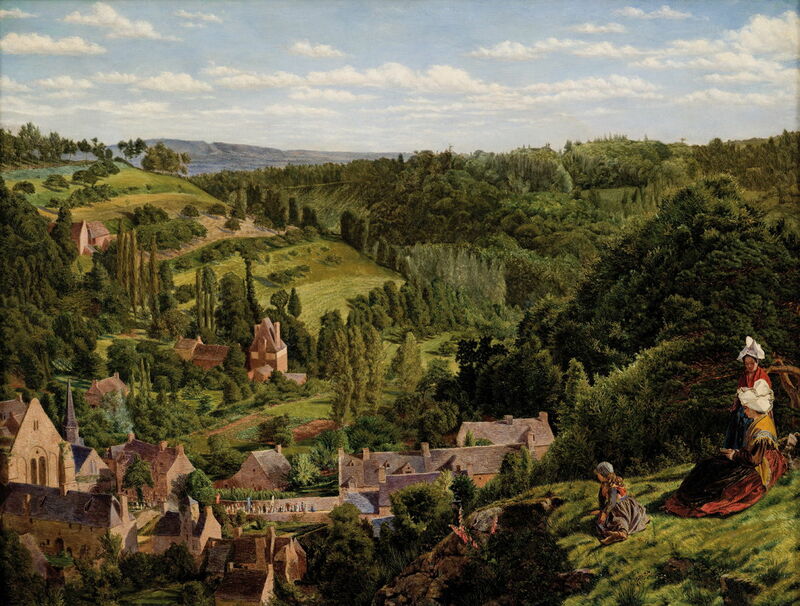 Thomas Seddon’s Léhon, from Mont Parnasse, Brittany (1853) is another startling example of an early Pre-Raphaelite landscape which shares this same look. The look is also the result of the prolonged painting time. Early plein air painters quickly learned that capturing a view so that it appeared natural required fast work for short periods – only an hour or two at most – in consistent lighting conditions over one or a very few sessions at the same time each day. To accomplish that, they sketched, and omitted detail. By setting themselves the requirement of capturing such great detail, true to nature, the early Pre-Raphaelite landscape painters made the painting process so protracted as to lose the specific details of light, shadow, and surface effects which actually make a realist painting appear real. In the next article I will look at how Pre-Raphaelite landscape painting evolved after the PRB dissolved in about 1853. Truth in (landscape) painting – this blog, short series. Posted in General, Painting and tagged Brown, Burchett, Collinson, Constable, landscape, painting, plein air, PRB, Pre-Raphaelite, Reynolds, Ruskin. Bookmark the permalink.